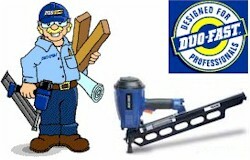 For over 60 years, DUO-FAST has been synonymous with professional-quality fastening solutions. Now, we make it easier than ever to find the tools and fasteners you need with DuoFlash, our interactive catalog and selection guide. Whether you're looking for the best in air-driven nailers or staplers, electric staplers, or manual staplers and tackers…DuoFlash puts all the information just a point-and-click away. If you already own a DUO-FAST tool and know the model number, use "Fasteners Fast" to find the genuine DUO-FAST fasteners that ensure top-of-the-line performance and productivity.